So last week I griped about the insanity of School Supply lists. Lest you think all I do is complain, today we’ll talk about what we can all do to help. 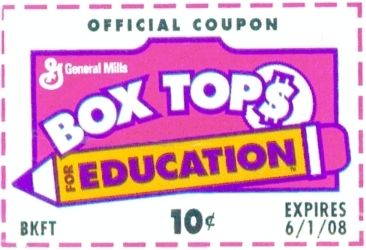 Submitted for your approval: Box Tops For Education. Now relax there’s no late night baking or early morning car washing all you have to do is buy groceries, and I assume you do that already. Second you need to look for these little suckers on the boxes or bags…yeah bags have ‘box tops’ too…go figure. Third you have to cut them out. Do you have to actually cut on the dotted line? No, but if you do your local Box Top Coordinator (or their spouse) will thank you…but more on that in a minute. Fourth you must have your child bring them to school…what, you don’t know if your school collects Box Tops? I’ll wait here while you go check……man, is it hot in here or is it just….oh you’re back, good. So if your school does collect them excellent, if not you should talk to someone in the office or at the ‘PTA.’ If for some reason they don’t like free money then you can go online and find someone who will gladly take them. You should be able to send them in anytime and the teacher should have a place in the classroom to put them. That’s it! That’s all you have to do and for each non-expired (yeah they expire just like coupons) Box Top your school collects you get 10 cents. Doesn’t sound like much, not worth the trouble you say? Consider this: the Box Tops For Education Program has raised over $320 Million for schools since it started. Our school averages a little over $1,000 a year and you can earn up to $20,000 before they cut you off. Want to raise even more easy money for your school then tell your neighbors without kids to save Box Tops for you or bug your childless co-workers, they love that. Put a notice up in your church, synagogue, brothel, bar or other house of worship. They all count; doesn’t matter where they come from. Now I can’t speak for all schools, but I can speak for ours because my lovely wife happens to be the Box Top Coordinator. She sends out a notice early in the school year to every child in school explaining the collection process though she usually leaves out that bar/brothel part. 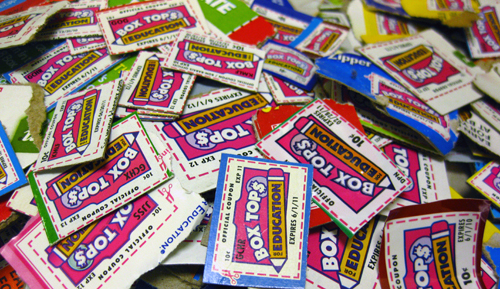 Since kids generally care more about spending money than raising it we have a prize for the class that collects the most Box Tops. One year it was a digital camera (man did my son want to be in the class that had won the camera the year before) and more recently it’s been a pizza party with some locally donated pizzas or extra recess. There’s a ton of information at the Box Tops For Education site. You can sign up for coupons, find out exactly how much your school has raised, see a list of participating products and find other ways to save money through the program. Now for the behind the scenes stuff. As I said earlier my wife is the Box Tops Coordinator for our elementary school of about 600 students. To say she was conned into it might be exaggerating, but it was a little bit like Tom Sawyer getting the other kids to paint the fence for him. 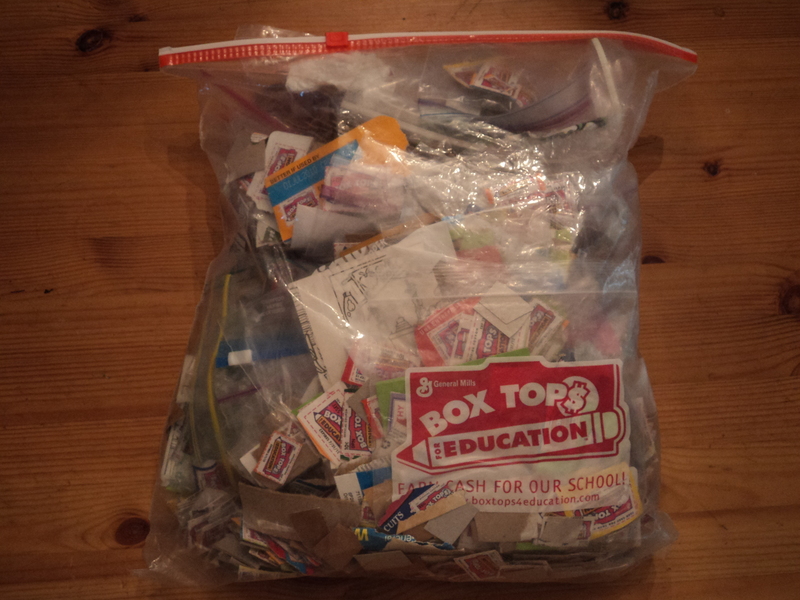 The Coordinator’s job is to explain the process to every student/teacher/administrator/parent in the school, collect all Box Tops from each classroom, cut, trim, count and organize them all then send them to be redeemed for the cash. Here’s what they don’t tell you. True, the Box Tops don’t HAVE to be cut into perfect little rectangles BUT we have to pay for shipping the box full of them so the lighter the better. The previous coordinator (‘Tom’) actually figured out how much was saved on postage by trimming them all and decided it was worth it and we believed her. 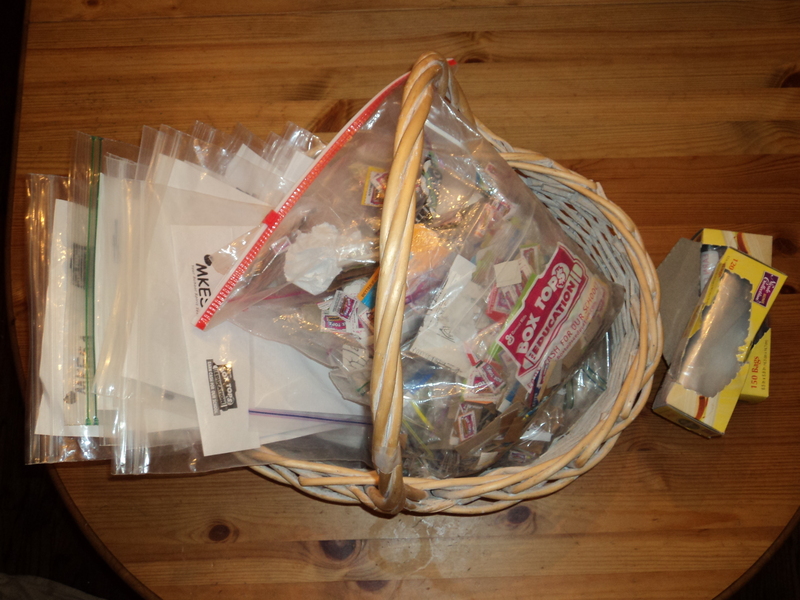 As a result my wife and I are up at 3:00 in the morning (OK I usually bow out at Midnight) the day before the deadline cutting and sorting them into little groups of 50 and bagging them up. If you know who your Coordinator is please forgive the bloodshot eyes and go easy when shaking their hand because it’s probably pretty sore from all that cutting. You may also want to pat them on the back and offer some heartfelt thanks for everything they do for your school. But, and you didn’t hear this from me, if they try to talk you into being the new Coordinator…RUN! This entry was posted in fundraising, Helpful Advice, Humor, Kids, saving money, school and tagged box tops, BT4E, BTFE, classroom, coupons, elementary school, fundraising, money, volunteering. Bookmark the permalink. For the record those ‘bag tops’ are slippery little suckers and really hard to count…they should be worth 20 cents! Thanks for the reminder – We are kidless but I will try to be more aware when putting boxes in the recycle bin and save any box tops I come across. My niece stated kindergarten last week and I’ve already been hit up for my first fund raiser! I’d rather just give them cash! Thanks for that riveting and humorous article on Box Tops JK! where did you get those baggies from? There so cute! I too am a box tops coordinator for my kids school. going on 2 years now. I also have access as a coordinator on the BTFE webpage but never have I seen those baggies there nor when they had the coordinator store. They’ve changed it all around so much though well thanks anyways and great blog!!!!! My wife said she did indeed get them directly from BTFE, but it was more than 2 years ago.